As the mother of two young kids I see it happen from time to time on the school playground: one mom tells another mom about a fantastic after-school children’s activity, which results in the second mom immediately rushing home and signing up her child for the activity mentioned by the first mom. It’s proof that parent testimonials are powerful. 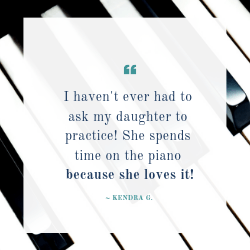 If piano teachers could confidently rely on parents spreading the love, we would never again have to worry about filing our studio schedules. Unfortunately, however, even parents who love us to bits don’t spend their days singing our praises; their lives are just too busy. This means, that if piano teachers want to harness the power of parent testimonials, they have to help the process along a little. Parents aren’t always aware of how helpful their opinions can be and, when given the chance, will be happy to talk up your tremendous teaching skills. 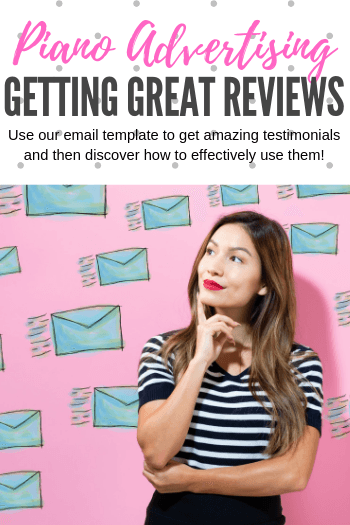 In today’s post, we’re going to share a not-at-all awkward way to ask for parent testimonials and then a roadmap for how to turn those testimonials into a full teaching schedule. Using testimonials to advertise your studio is a powerful way to give potential clients the reassurance they’re looking for when seeking out activities for their children. Having reviews from other parents on your studio website, advertising materials, Facebook pages, and Instagram accounts is the next best thing to in-person, word-of-mouth advertising. When asking for testimonials from the parents in your studio, avoid sending out a mass email. Instead, select five to six families with whom you have a great relationship. It’s a good idea to also give these families an idea of what you are looking for, as “testimonial” can mean different things to different people; you don’t want a one-sentence response, but you also don’t need them to spend hours writing a masterpiece. When you have selected the perfect parents for powerful testimonials, read our testimonial email criteria and then modify the provided template. The first paragraph should belong to your reader – Begin the email by talking about your relationship with the parents’ child, your recent experiences in lessons and giving an acknowledgment of the parents’ involvement in the great things their child is accomplishing. The second paragraph should be your “ask”. Don’t be apologetic in asking for a testimonial and don’t be too verbose in explaining why you need this favor. Parents understand that teaching piano is your income source and will be more than willing to provide you with help in growing your studio. The final paragraph should outline exactly what you need from the parents. Busy parents may push aside a task that feels too time-consuming (even if they have the best intentions). Clearly show them how easy providing a testimonial for you will be by giving them some prompts and outlining a criteria. Your rate of response will be higher if you provide specific information related to testimonial content and length. Miranda’s lesson last week was so much fun. I can’t believe how far she’s come since September! Thank you for your support at home in keeping her practice consistent. She’s at that point in her learning now where she’s experiencing the benefits of regular progress. It’s so exciting to see her mature into a wonderful pianist! She’s such a joy to teach. I’m writing you to ask for a favor. I have a few spots left in my teaching schedule that I would love to fill. I’m hoping to be able to use some “testimonials” from my current students and their families in some advertising materials I will be creating. I’m wondering if you’d be willing to write a testimonial for me? Miranda’s enjoyment of lessons: What are her favorite aspects of coming to my studio? Miranda’s progress: What have you been most excited to see when it comes to her learning? Your experience at my studio as a parent: What do you like about the environment at my studio? What has been your experience as a “piano parent”? I don’t need anything too long – two to three sentences on each of those topics would be fabulous. Thank you in advance for your time, it is much appreciated! Once you have your parent testimonials it’s time to put them into action. Begin by selecting short snippets that effectively capture what you hope potential clients will appreciate knowing about your studio. Avoid lengthly paragraphs and instead focus on short sentences that pack a punch. Choose sentences that you believe will connect with parents who are new to the piano lesson experience. Don’t feel like you have to use an entire testimonial. On social media. Use a website like Canva to create professional-looking graphics that are sized correctly for Facebook and Instagram. Include just one testimonial per graphic. Bold the words that you want to stand out (see example below). When posting these graphics to your Facebook and Instagram always include links to how potential clients can contact you. If they have an instant reaction to your selected words, you want them to be able to act on that immediately. On print advertising. Include a one-sentence testimonial that you feel captures the essence of your studio among your other needed information. On your website. Intersperse testimonials throughout your website (instead of having a separate page devoted only to reviews). In your waiting area. Use Canva to create testimonial posters. Bold the words that you want to stand out. Create a “Thank you!” area in your waiting room and hang new posters regularly. On your recital program. When designing your studio recital program, include a testimonial that touched you, made you especially proud or reminds people of your studio’s mission. One month ago, Trevor and I launched Growing With WunderKeys: a once-a-week email newsletter with the sole purpose of helping piano teachers find piano students and build bigger studios. If you are just starting a studio, have moved to a new city, have expanded your teaching hours, or simply need more piano students, you’ll want to hop on over to the sign-up page and subscribe to Growing With WunderKeys too. After you join Growing With WunderKeys, every Saturday morning we’ll help you to build a bigger studio. And, of course… you’ll continue to receive your twice-weekly piano teaching posts from Teach Piano Today.